BlackBerry apps are more profitable than Android | BlackBerry Blast! 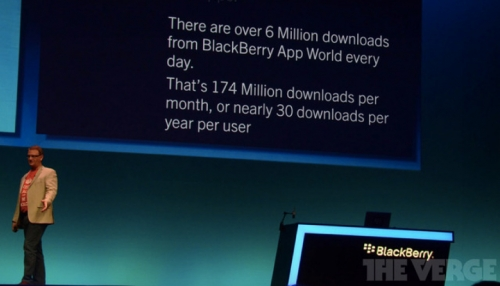 RIM executives touted BlackBerry's ecosystem Tuesday at BlackBerry DevCon Europe. Alec Saunders, RIM's VP for Developer Relations told the audience that there are currently over six million daily downloads from the BlackBerry App World for a total of 2 billion downloads so far. He suggested that the BlackBerry App World generates 43 percent more daily downloads "per app" than Apple's App Store and has more paid downloads than the Android Market. The most interesting piece of information is that BlackBerry apps are the second most profitable apps behind iOS apps. The BlackBerry App World generates 40 percent more revenue for developers than the Android Market, and 13 percent of BlackBerry app developers have made more than $100,000 from their apps. Not bad.